Rock’n’roll doesn’t have to be complicated to be great. In fact, sometimes the less complicated it is, the better. I’ve always loved garage rock, mod rock and punk because they can sum up everything necessary in three minutes or less. I remember Pete Townshend’s reaction to the film Fight Club (paraphrased here) that it “Wasn’t anything that wasn’t expressed in three minutes of ‘My Generation’.” I’ve always loved short terse songs that blow your mind and totally sum up an urgent need for expression. 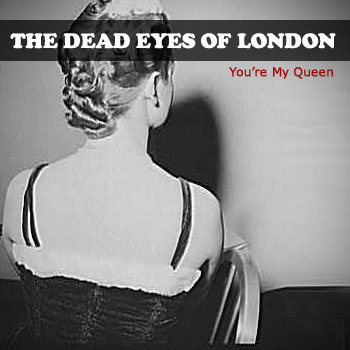 The Dead Eyes Of London do exactly that in 3:03 with a total of 33 words to the lyrics on “You’re My Queen” and the fervent, furious pace never lets up once. There is really nothing to explain here—this guy’s slightly obsessed with his female muse and the harmonies are fantastic throughout. The combination of Chan Vallarino on guitar and vocals, Nick Ramirez pounding the hell out of the drums and Alfie Lucero beating on his bass and adding the perfect back up vox is quintessential mod inflected garage rock. One thing that should be said, The Dead Eyes Of London are even better live than they are on record—they just seem to be willing to let loose more and really rock it out, which is saying something, because this track is searing as it is. Also, live they often play some covers that will amazing (seriously, they can nail The Kinks and The Yardbirds in one show with love and accuracy). Luckily a live experience is right around the corner. 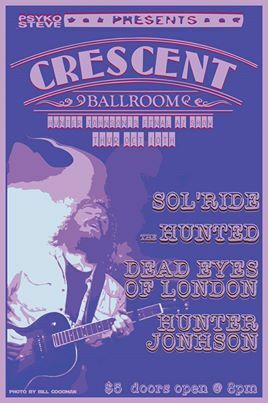 You can catch The Dead Eyes Of London this Thursday, October 10th at Crescent Ballroom on an amazing lineup that features Hunter Johnson’s last appearance before he moves to Nashville, The Hunted and Sol’Ride (a new outfit featuring Mikki Jeane and D.L. Harrison!). This should be quite a high energy show and it’s only a $5 cover, show starts at 8pm and that means the show actually starts at 8pm at the Crescent.